The main A82 departs Spean Bridge in the direction of Inverness by first climbing up the side of Glen Spean. 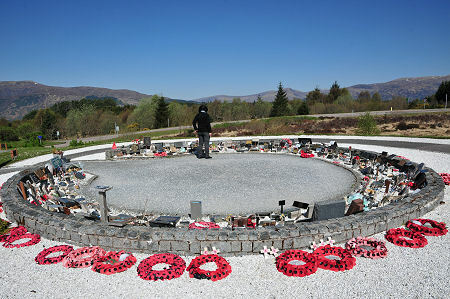 As the road leaves the glen it turns to head north, and as it does so, it passes the Commando Memorial on the left. Access to the car park is a short distance along the B8004. 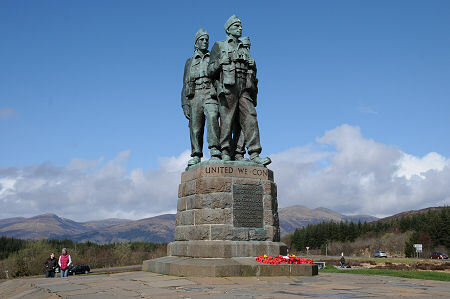 The Commando Memorial stands some 17ft or 5.2m high, and comprises a group of three bronze commandos dressed in typical World War Two uniforms and equipment including cap comforters, ammunition pouches and weapons. They are looking south towards Ben Nevis. A large inscription on the plinth just beneath their feet reads "United We Conquer", while the plaque on the front of the plinth reads: "In memory of the officers and men of the commandos who died in the Second World War 19391945. This country was their training ground." In 1942 the Commando Basic Training Centre was established at Achnacarry Castle, some six miles north west of the site of the monument. Volunteers would arrive at Spean Bridge railway station, and would then march the seven miles to Achnacarry Castle, past the site on which the monument now stands. Training was carried out over large parts of Lochaber and was highly intensive, often using live ammunition. Anyone failing any part of the course caught the next train south, back to his unit. 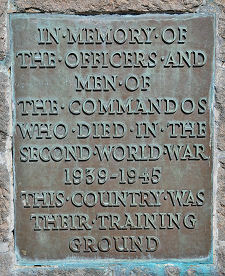 In 1949 a competition was opened to Scottish sculptors to design a fitting memorial to the commandos. The winner was Scott Sutherland, and the bronze was cast by H H Martyn Ltd, of Cheltenham. 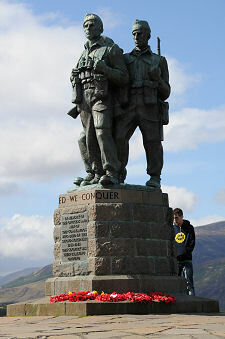 The Commando Memorial was unveiled by HM Queen Elizabeth, the Queen Mother, on 12 September 1952. 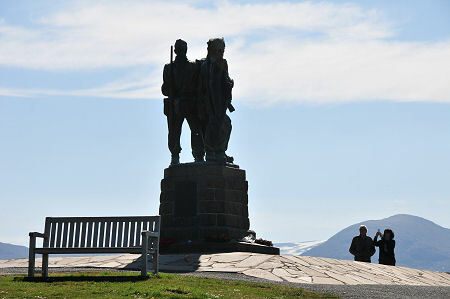 It has since become a stopping off point for many visiting the highlands: partly because of what the memorial represents; partly because it is simply such a fine monument; and partly because of its magnificent setting. 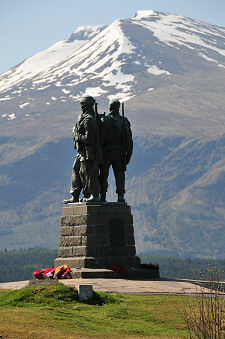 The Commando Memorial was designated as a listed structure on 5 October 1971, and its listing was upgraded to the highest, Category A, status on 15 August 1996. On 18 November 1993 the Commando Association was awarded the Freedom of Lochaber, and to mark the occasion a much more detailed plaque was fixed to the rear of the plinth setting out the story of the commandos for future generations. In recent years an Area of Remembrance has been established not far from the Memorial. Many who served as commandos during World War Two have had their ashes placed here, and the area is also home to many memorials to Marine Commandos and others who have died in more recent conflicts, from the Falklands War through Iraq to Afghanistan. A fitting and poignant reminder that as a nation we are still expecting our young men and women to go to far away places and risk their lives on our behalf. Those with an interest in the commandos can find out more in a display at the Clan Cameron Museum at Achnacarry, and at the West Highland Museum in Fort William. Meanwhile, and rather closer at hand, a room at the Spean Bridge Hotel is home to an excellent collection of artefacts and material covering the commandos and their role in Lochaber.